When you plan on hosting summer parties and gatherings at your Phoenix home, consider adding custom outdoor lighting. Using this type of lighting gives you a way to illuminate the features of your home’s exterior, yard, or other outdoor areas. Keep the following tips in mind before your next party. Highlight features. Decorative outdoor lighting offers a way to highlight the features of your home’s exterior. For example, you might have a grand fountain that you want to draw attention to when guests arrive. Added value. Custom outdoor lighting can boost your home’s value. Compared to other remodeling projects, updating outdoor lighting is relatively easy and inexpensive. Imagine changing your builder-grade patio light to a custom fixture that complements your home’s design. Safety. Outdoor lighting helps lower the risk of having party guests trip and fall while trying to walk around in the dark. 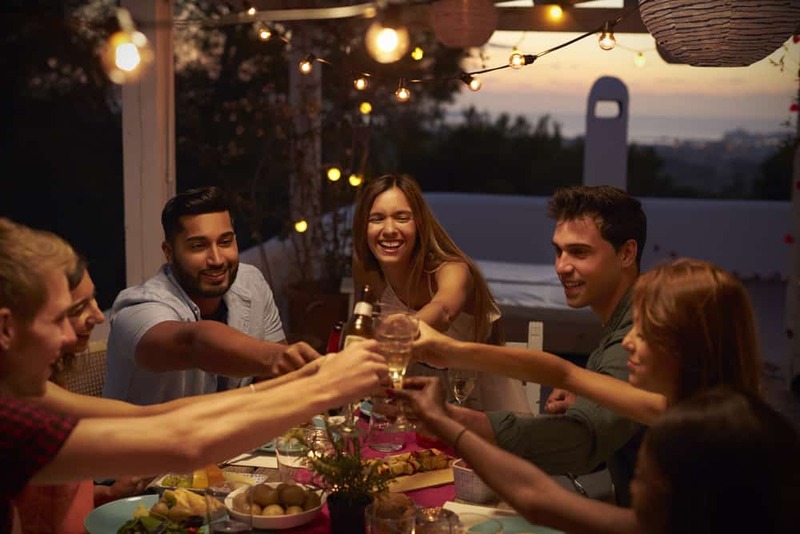 Whether you have a summer party in your yard or on your patio, it’s important to provide enough lighting for your guests to see where they’re going. More safety. Decorative outdoor lights can also provide enough visibility to deter intruders all year long. One of the decisions you’ll need to make is where to install your new lighting. You may simply want to replace outdated fixtures with something more functional or modern. You might decide to have lighting added to places that aren’t currently well-lit. There are several areas you should consider adding custom outdoor lighting. As the Phoenix temperatures climb, ceiling fans offer a way to keep patios cooler during gatherings. Consider adding a ceiling fan with a light. In addition to keeping guests more comfortable, you’ll have the added function of an overhead light. Many outdoor ceiling fan models have adjustable settings so you can increase or decrease the fan speed and the light brightness. This customization allows your guests to be comfortable no matter the time of day. Pendant lights and other types of decorative hanging lights are ideal for overhangs. These lights provide the right amount of lighting for guests as they sit and eat, play card games, or chat on the patio during your party. Hanging a pendant light above your high front door is a unique design feature your friends will surely notice. You can choose from a wide range of hanging lights in different styles and designs to match your home. Wall sconces offer a way to illuminate impressive features on your home’s exterior while adding some decorative flair. Sconces also provide lighting so that guests can see where they’re going when it’s dark. Wall sconces are available with many options to suit any home. From contemporary to southwestern style, there really is something for everyone. Garage sconce lights offer custom lighting that helps illuminate the front of your property, including your driveway. This can make it easier for guests to get to and from their cars when it’s dark out. These lights also come in a variety of designs that can enhance the appearance of your garage. If you’re interested in sprucing up your home’s exterior by updating the look of your outdoor lighting, contact Turn It On Electric. Our electricians can work with you to install decorative lighting that enhances your home’s exterior.